When a person or entity’s negligence results in the loss of a life, surviving family members may have grounds for wrongful death damages. These monetary awards are meant to assist families with the financial hardship that often accompanies the sudden death of a loved one. 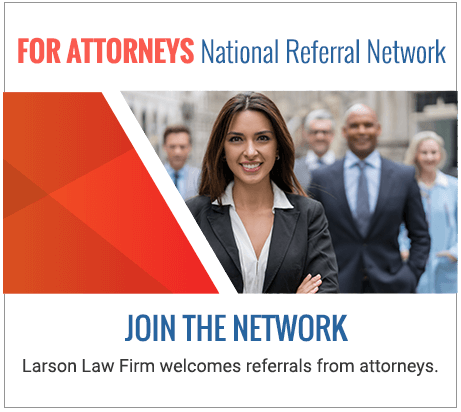 For more than 35 years, Larson Law Firm P.C. has provided comfort to families impacted by wrongful death. We know that no amount of monetary compensation can replace the life of a loved one, but it is our hope that a maximum recovery can help ease some of the financial burden these survivors’ face. Our team of experienced North Dakota wrongful death lawyers is equipped with the knowledge and resources to investigate the fatal accident and determine fault. We then aggressively seek to hold all responsible parties financially accountable for the extensive pain and suffering they caused. We are committed to helping families reduce their financial burdens, so they can focus on healing after a tragic loss. With a network of experts and investigators to call on, our seasoned attorneys have the resources to thoroughly and accurately identify the cause of a fatal accident. Once this determination is made, we earnestly work to obtain fair and just compensation. The statute of limitations for wrongful death lawsuits in North Dakota courts is two years, but it is essential to seek legal help from a qualified wrongful death lawyer as soon as possible. Critical evidence can be lost or destroyed, and witness memories may fade. These circumstances can result in lost opportunities to properly research and prepare for the lawsuit, further delaying a successful outcome in your case. When you contact our team, we quickly begin investigating the causes of the accident, while documenting the full extent of your losses. When determining an adequate compensation amount, we consider loss of financial support, companionship and guidance. Attorney Mark Larson’s background as a certified public accountant becomes particularly helpful when quantifying these losses. As a Civil Trial Specialist certified by the National Board of Trial Advocacy, he is a valuable asset to our legal team and your wrongful death claim. At the Larson Law Firm P.C., we believe that at-fault parties should be held accountable for the horrendous pain and suffering they have placed upon you and your family. That is why we diligently fight for your rights at the settlement table or, when necessary, in a court of law. If your family member lost his or her life to the negligence of an individual or business, contact our law office via our contact form or call us at 701-484-HURT. We represent families from Ward, Williams, McKenzie, Pierce and Mountrail Counties from our office location in Minot. Call us today to begin fighting for the compensation your family deserves.